I am waiting eagerly to see if the golden orb weavers emerge again this season. It's a real mystery what is going on. The summer of 2011 brought an influx of golden orb weavers such as the town had never seen before. Last year, there were none. As spring is springing, the obvious question is: will they return? And why weren't they here last year? One theory is given below. This year will tell if it's right! And the other mystery - how did the daddy long-legs know about the feast on offer? First, a recap. When we moved to Castlemaine in Central Victoria, Australia, in April 2011, there was a glorious adult female golden orb weaver (Nephila edulis, family Nephilidae) at the front door to greet us. So she was named Welcome. With a body length of over 2 cm, she was huge. Not long after, Welcome produced a golden egg sac in the bushes nearby. It was already well into winter. The first frost came and the morning sight was welcome dropping from her web. She recovered in the day's warmth, but the next day's frost killed her. I watched that egg sac, checking it every day. Nothing happened throughout the whole winter. Up in Kalimna Park, where I was watching another half dozen Nephila, three made egg sacs, and all disappeared with the frosts. The egg sac had faded when I cut it lose in September 2011 and placed it on the porch. It was not until early January, in the summer heat, that I noticed a living bundle near it. Young, hundreds of them. I tried counting from the image below, but gave up. 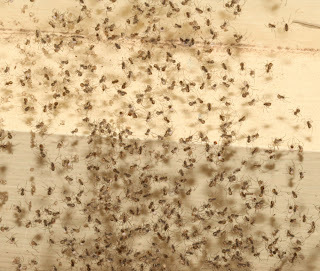 Over the next few days, they spread and regrouped continuously, little white bodies appearing in the mass of brown as a mess of tiny shed skins appeared below. They were moulting, the slightly larger freshly moulted young showing off their beautifully marked white abdomens - only visible when I enlarged the photographs. At the end of the week, they were well spread, never to regroup again. A day with a light breeze and they dispersed on their tiny filaments of silk. It was then I realised that I was an idiot. They could only be blown into the house as a breeze doesn't come from the house out into the world. And they did - hundreds of them into the living room. All over the furniture. All over the ceiling. While they were still in groups, I collected them on brooms and other soft objects, leaving them outside to disperse again. But they spread, meaning it was a matter of collecting them one at a time. They were all over ornaments, such as this little one on the cage of a music box with toy songbirds. But I was not fast enough. 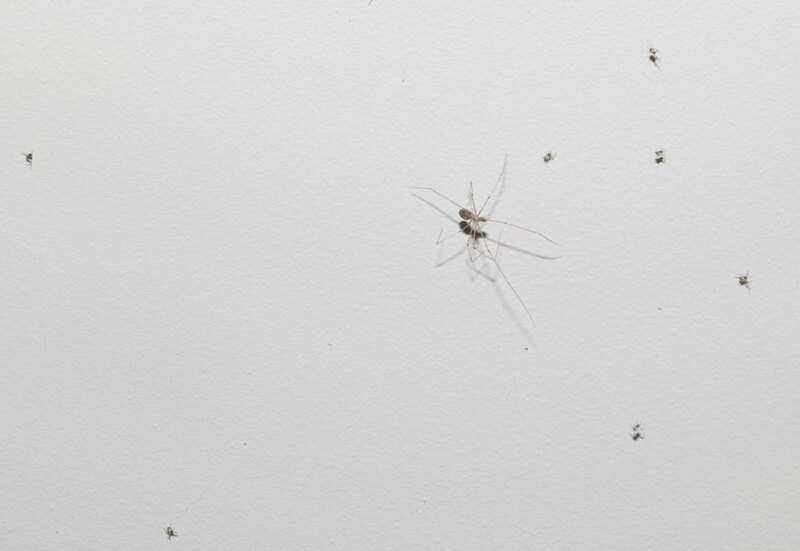 The greatest mystyery of all: within a few hours, five daddy long-legs spiders (Pholcus phalangioides, family Pholcidae) had gathered in the front corner of the lounge room where most of the young landed. I have no idea where they came from. We have a lot of daddy long-legs, but there were none in the living room that I had noticed. The daddy long-legs were having a feast. How did they know to come? Spiders never cease to amaze and entertain me. So now I wait. None of these young grew to adults during that summer. Despite the huge numbers in autumn 2011, there were none last autumn (March / April in Australia). Will any of them appear this season? 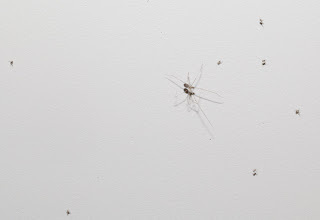 An American reader has asked about the daddy long-legs in the photo above. Is it a spider or a non-spider harvestman? 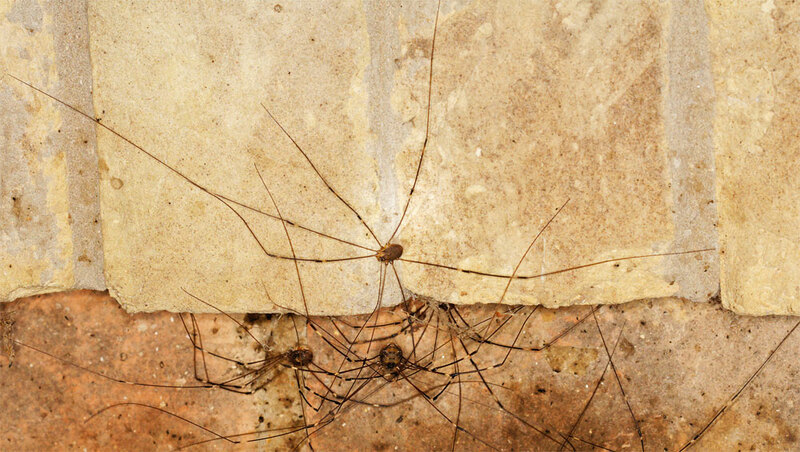 Two different groups of animals are called daddy long-legs, the spider version and the harvestman version. Both have eight long spindly legs. Both are arachnids. I gather Americans are more likely to call the spider version 'cellar spiders'. The differences: spiders have two body segments with the legs coming from the front bit, the cephalothorax. Harvestmen only have one body segment. The spider version make webs while the harvestmen don't. Spiders are much more likely to be inside the house than harvestmen. I photographed huge harvestmen in Texas. If you look at the image on the blog, you'll see the daddy long-legs has two body segments while the harvestman above has only one. Because of the confusion, arachnologists usually refer to the spiders as pholcids and don't use the 'daddy long-legs' common name. 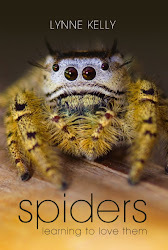 This site is a working draft for "A field Guide to the Spiders of Australia" by Robert Whyte and Dr Greg Anderson for CSIRO Publishing due to be published in 2014-15. I'll be using it as my prime site for classification from now on. Postscript: Greg Anderson has sent me a fascinating paper on Nephila. It seems the questions I am asking about N. edulis are not answered - yet! Plenty of research to do which can be done by ordinary people out there watching them. 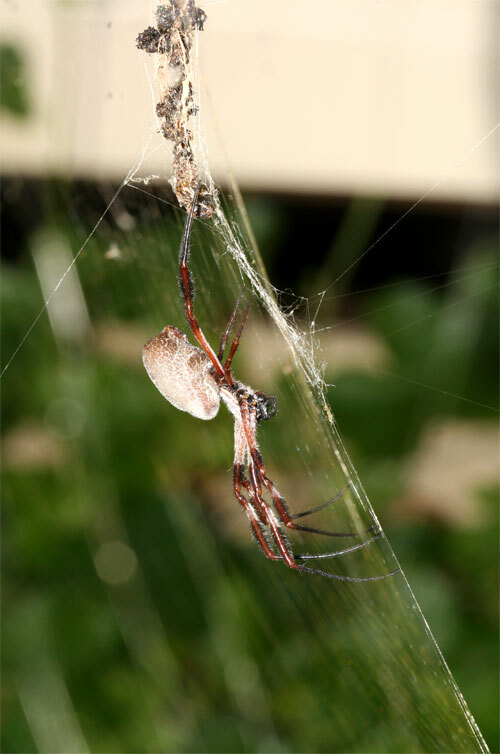 "Given the large number of studies that have focused on the behaviour and evolutionary biology of Nephila spp., it is some- what surprising that little work has been undertaken on their population biology. In the Sydney region, adult female N. plumipes are univoltine, appearing in late December to February (depending on the year), and reproduce from late summer to autumn (February–May) (Austin and Anderson 1978; Elgar et al. 2003a). From June to September (winter–early spring) the population comprises a range of immature size classes, and a declining number of adult females that have all disappeared by August–September. This pattern becomes more complex in the northern, tropical part of the distribution of N. plumipes, where the breeding season is more prolonged, and populations may be bivoltine (A. Austin, personal observation). Far less is known about the population biology of N. edulis, which occurs throughout the arid interior of the continent (Fig. 87). In arid regions this species appears to have more tran- sient populations, where dense aggregations of adult females will occur at a particular site in one autumn and then disappear, often for many years (A. Austin, personal observation)." Reference: Harvey, Mark S., Austin, Andrew D., & Adams, Mark. 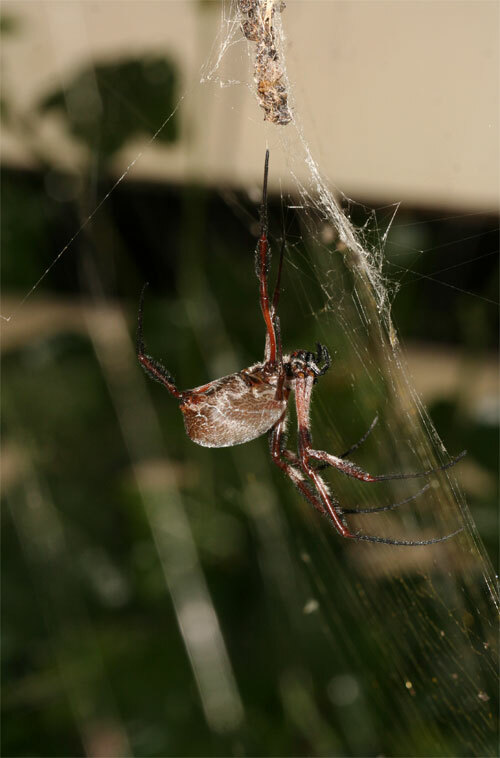 The systematics and biology of the spider genus Nephila (Araneae: Nephilidae) in the Australasian region. This is awe-inspiring, and a little bit funny, as you ended up with lots of spiders indoors, an event a spider lover like me finds wonderful. Finding out there is little or no research on a particular species is exciting, especially when one favors that species. As for the Daddy Long legs, I wonder if somehow scent is involved. Much of what spiders do is unknown, and that too, is exciting. Thank you, ZBra. I am now back into blogging regularly as the season starts here. I can't wait to see if we get any Nephila this year. Spiders are such amazing fun - and it is all there for free for anyone who just takes the time to get to know them! Oh, and as for the scent attracting the daddy long-legs, that seems logical given they have chemical sensors in their hairs. But the juvenile Nephila are tiny, and the daddy long-legs must have been at least ten metres away, or I would have noticed them. You don't usually get five of them in close range. How strong is their scent detection? I have no idea, and doubt others do either. I'll check the gospel, Foelix's 'Biology of spiders' but I have read it thoroughly and certainly got no indication of long range scent detection. More research to be done. I do adore watching a daddy long-legs pair on a web strumming out signals to each other. Is that language? Hello, I live in Alabama, USA. The daddy long legs here are massive in size and regularly cluster in groups ranging from 3 to hundreds. It is quite a site to see. They seem to congregate as a family. They also clean the webs of other spiders by removing and eating the "leftovers", We also have many many large Golden Orb Weavers. Their common name here is Banana spiders. I have several living around the eaves of my home. And yes they are so fascinating to watch, along with all the other species that inhabit the corners and under eaves. I am starting to learn some of their names and habits. Was terribly afraid of them when we moved here but am now growing accustomed to them and even find myself feeling a little sad when one dies or disappears. What you call daddy long-legs, we call harvestman. They have only a single body segment and don't make their own webs. I have seem a small cluster of very large daddy-long-legs / harvestmen in Texas, but nowhere near as large as you describe and I know can exist. I'd love to see it. 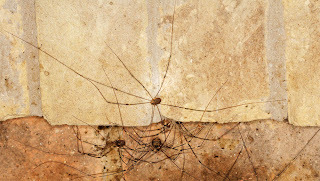 What we call daddy long-legs, you call cellar spiders. Very confusing! I am delighted to hear about your changed attitude to your Golden Orb Weavers. The more you watch them, the more you will fall in love with them as individuals. It's been raining for 3 days now and I haven't seen my Golden Orb Spider. Is she missing or does she wait for the rain to stop before rebuilding? I have noticed them disappear into the foliage during rain. Hopefully she will emerge when the rain is done. It is amazing how attached we can get to spiders we have been watching for a while. And Golden Orb Weavers are so stunning! Please let me know if she emerges! I have a garden orb weaver, that I have tended to in our kitchen just off the dinner table(which we never use to eat). She has built her web from the wall to the ceiling, to the large plant and the end of the table. I put strawberry top out in the Summer, that attract scores of fruit flies, she has moved her web higher and higher to catch them. When her web was a foot off the table, she didn't catch them, about a week of this she is now about 2 feet from the ceiling and catches quite a few a day. I will often herd them towards her web with a misty spray bottle. If I spray close to her, she climbs over to the plant and hides under a leaf or climbs high up to the top of her web near the wall in the corner. So I am guessing that is what she'd do if she were outside and it rained. I have watched her since the first week of Summer back in June and it is now the first week of September and it has been both fascinating and a learning experience. From watching her feed and spinning her web, to molting about once every 3 weeks. She is quite big now. I named her Mickey. Just tonight it appears she is laying her eggs as there is a small sac appearing right beside her, though it is difficult to say for sure until I can get a better look. I don't want to disturb her and it is difficult to see her up close, as the table is up against the back wall. I would have to climb on top and crawl over to see her up close. But if that is the case, then her life will be coming to a close and it will be time to move the sac outside, as I do not want baby spiders hatching in my kitchen. I will find a safe spot on my patio to put them. And hopefully one of her kids will join us next Summer. Truly a fascinating creature, that I have thoroughly enjoyed watching. Much to the puzzlement of my Teen aged Son, whom is not so fond of Spiders. Thank you so much for such a wonderful story - and described so fully. This sounds delightful. The free entertainment on offer in nearly every house and garden is overlooked by almost everyone. I am so glad that you have been able to enjoy the fascination at such close range. I've been watching a cross orb-weaver over the past couple months, she layed her eggs and passed away as of today when I checked. I nearly cried she was beautiful. I hope I get to see her babies hatch and grow. I'll be watching. It is amazing how beautiful spiders are, especially the orb weavers, when you watch them over time and get to know the individuals. She had to die. It is the short lifespan they have. I do hope the young hatch and grow. They will ballon off and most - at least 99% - will not grow to maturity and breed. Any mature adult spider is a real survivor. Let me know more of the saga if you see the young hatch! Thank you for the comment. Delighted to meet you, Jilly. Thank you so much for your comments. I look forward to more! The more you watch, the more they just become interesting and the terrifying goes. I am not sure what you mean by 'garden spider' in Mississippi, but the orb weavers tend to die before winter. You can move the egg sac, but maybe wait until she has gone? Although, if it is a hassle, you can move her too. Just move part of the web and attach it to somewhere less obstructive. She will probably fix it up there rather than putting it back where it was. All the best with it! Thank you for caring for the spider! Thanks! They call them garden spiders here (among other things). She gets to stay, and I will wait til she dies to move the egg sac. I suspect there may eventually be other egg sacs since she eats a lot. We have Argiope aurantia here, at least that's what she appears to be. Thanks! Ahh - Argiope, wonderful! I am jealous. Have fun watching her and then waiting for her spiderlings to hatch. What a great story! Thank you! Please tell your daughter that i think she is a hero! Spiders are the best free entertainment (and education) in the world. I am so pleased that your Argiope (is that her name as well as her genus?) is providing so much free and educational entertainment. I think your new conclusion about eating food whole may be in error - or you are discovering new spider facts and your daughter needs to do a science project on it! Spiders will crunch up prey sometimes, but they still liquify what they are going to eat. They can only take in liquid and filter it finely as it goes into their mouths. Are you getting plenty of photos? If so, please send me an email to l.kelly @ latrobe.edu.au (without the spaces). I'd love to see her and your daughter! I work at a University in NW Florida and I have a beautiful female that lives right outside my office. Today she laid her egg sack!! I'm so excited I could burst! But I can't find any information on what happens to the female after she lays the sack, the general timeframe for the sack to hatch or approximately how many "grandbabies" I can be expecting. By any chance do you know any of this information? I forgot to mention, she appears to be a "banana spider" or golden orb weaver. It is so good to hear from you. I am so jealous. This sounds extraordinary. I found information on the life cycle hard to find, but can tell you my observations. It partly depends on whether you are talking about a golden orb weaver or the yellow and black spider, Argiope, although I suspect the life cycle is fairly similar. Both are referred to as banana spiders. Is this the spider you have? I expect she will then die with winter and her egg sac hatch later, but I am not sure. I would LOVE to hear more from you as you observe it, and see any photos. I would love to do a blog on your spider! I submit my next book manuscript this week and then will get back to blogging spiders. I can wait! Hi Lynne..I'm so glad I found your blog, I can't wait to delve into it some more! I live on the Florida panhandle so I guess our seasons are the exact opposite. Since late August I've had the privilege of caring for a beautiful golden orb weaver in my front shrubs. We had quite a few around here but I favored her. I fed her at least 2 grasshoppers everyday so in no time she was the biggest spider of them all. One day at the end of September I went out to feed her and she was super skinny so I figured she must have laid her egg sac sometime in the night. I was sort of sad because I have done a lot of reading on the orb weavers and I knew that meant her time was coming to an end. During the next couple of weeks I kept an extra close eye on her and she remained as lively as ever..also I never could find an egg sac. So I continued caring for her and eventually she became as fat as she was before. Then near the end of October we had our first cold spell, and very windy weather with hard rain. I knew she wouldn't make it. But the next morning I found that she had relocated during the storm higher up in a tree next to the shrubs (about eye level), and I couldn't find any of the other orb weavers. I wonder if she survived because she was so well-fed? Every time we had a cold night or a storm I would go out expecting not to see her and she would surprise me every time. So yesterday, November 18th, was a cold windy raining buckets kind of day, and this morning, she is gone. I never thought I'd be sad at the loss of a spider but I found her so amazing, therapeutic to watch, even. I see her egg sack now, under a leaf that was near her web. I'm not sure if she laid it that first time or sometime after, or if there was more than one sac, or what..It doesn't get as cold here as it does some places, but throughout the winter we will have some freezing weather. I don't see how that sack will survive. Do you think I should try to relocate it? And if so, where would you suggest? Do the sacks survive freezing weather? I'd love and appreciate any information you could give me. I have some pics and video of her but I don't think I can add it to the comment. Thank you so much for such a wonderful comment. Isn't it wonderful to follow the lives of individual spiders? I have now sent off the manuscript for my next book to my publisher and can get back to blogging my precious spiders! Your post has inspired me to get back to taking the torch and camera out each night. It does sound like your favourite (does she have a name?) has survived because she is so well fed and smart enough to relocate. I know all about the sadness of losing a spider. I was devastated when I lost my wolf spider, Theresa, one of the stars of my book. I had taken hundreds of photos of her and she was quite used to my presence. She was part of my daily life. I even watered her when the weather was very hot and dry and she came up to drink the droplets every time. The sac will survive, I assume, or there wouldn't be any spiders in the area. I have relocated a scam successfully, but I am not sure if it is necessary. I am really keen to hear more of the story! Two correspondents from Florida now! Wow! I'm so happy to hear my comment inspired you! My spider had the most common spider name you could imagine..I just couldn't help but to name her Charlotte, lol. Her tiny boyfriend was George. My husband swears he can't remember a year that we haven't had them on our property so I pray that I have another pet next year. He talked me out of relocating the sac, although I've been so tempted. We had our first cold, cold night and some crazy wind this year, but hubby keeps telling me that Charlotte knew what she was doing. I'm really glad I got some pics of her. I'm going to go through my carousel and find some of the best to send to you. Thank you so much for the reply and I look forward to reading your book! My little garden orb weave is out at night and growing but I cannot find her resting place during the day, even though I now know what side of the web she is coming from. She is so well hidden. I can't deadhead the roses until I find her! I'd hate to prune her off the plant! Thank you so much for the videos and photos. I have taken a few still from the videos and will blog about them. Unfortunately things were a bit blurry - but that was because of the wind. How amazing that she was feeding and wrapping her prey in that wind. The silk is so flexible! I thought that I could see two females in the images. The males are much smaller, and the one against the blue sky and the one wrapping her prey appear to both be female. They look like Nephila calvipes to me. I'll do a blog post about her and Rose and Mysti as well. Maybe you can comment on that and tell me more! It is so good to hear from you. When I was writing my spiders book, I interviewed the guys who did the animation of Charlotte for the film and told them what a huge impact they had on the attitude to spiders. They were delighted by that effect of their work. I am afraid that her dying once she's laid the egg sac is the way of the world. I'd be really keen to hear of any alternatives. Your Charlotte is a real survivor - incredible aren't they? The egg sac will almost certainly survive. If they didn't, there would be any adults for the following season. I would be interested to know how the Nature Center responds. As for the male, they are much smaller that the female. Although in most spider species, the males can live on after breeding, that isn't always the case with golden orb weavers. The female will often eat them after mating. I have photos now from Poppy. Would love to see any you have as well. Thank you again for writing and please send updates! Hi Lynne and Happy New Year! I am your third Floridian! I love this post. You have a heart of gold to save all those babies. I am in a situation myself. I took down the sac of my friend who lived between the porch posts this summer (a nephila clavipes), it was on the porch ceiling and would have been destroyed during pressure washing. I took it down on the last day of the year and had it outdoors in a glass year with a breathable lid while trying to decide where to put it. Today the nymphs hatched!! They picked the first freeze of the season!! When I saw they were coming out (at sundown), I put the sac in a shallow dish of leaf litter on a table on the porch. About thirty of them were in the jar but stuck in a bit of condensation. I brought the jar inside and they have all dried off an are trying to exit the jar. Should I put them outside tomorrow even though the high will be about 55F? I am worried they won't survive as it will probably freeze tomorrow as well (predicted low is 35F tomorrow but you never know). Do you have any thoughts for me? I have emailed the local extension office for the university here and set a question in BugGuide.net, but an internet search did not illuminate questions on nymph survival in freezing conditions of day of hatching. :( I hope the best for my little friend's babies but am at a loss as to how to proceed. Happy new year to you and all spider-lovers in Florida. What a fascinating story. If I can do my calculations right, 35 is close to freezing, about 1.7 deg C. That is cold, but I am pretty sure they can survive it. I am very keen to know what BugGuide or anyone else suggest. I suspect Nature knows better than we do. Unfortunately, the reality is that most will not survive whatever you do. If they do their first moult when all confined together, they will start feasting on sibling stew and most will die anyway. Not pretty! Sorry, but my advice is that they need to be free to leave. PLEASE let me know what happens! I put the dish with the leaf debris and the sac in a tall brown paper grocery bag the garage and the little jar with the others laid on side with opening toward the sac. The garage was a little warmer than the outdoors. Just checked and no one is doing much, littles were still in the jar and no one else has exited the sac. the jar occupants were all on a couple of paper towel pieces so I gently dumped them into the litter by the sac. Maybe too cold for them to move much? It is about 45-50 in the garage. Maybe keep them there until they start to move and then put them outside? I have not heard back from anyone else. No moulting yet. I will let you know what happens, a bunch of thanks once again! HI Edie. Thank you for writing! I would adore to have more Nephila than I could count. In fact, one would be nice. We have had almost none in the area ever since the burst of activity when I took the photographs above a few years ago. But we have just had a wetter winter after years of drought, so maybe they'll be back this year. I also hope we'll have Argiope. In both, of course, we have different species but they are very like yours. I find the egg sacs very hard to find. I only collected the egg sac because it was attached to a structure which was going to be moved. I think that wherever the spider leaves it is the most likely to be successful. If you want to observe it by moving it, then somewhere outside would be best. Inside would be too dry and warm. I am so pleased they have rallied after the cyclone. Please let me know if you find the egg sac, and any other observations. Yes, I am still here. Since the Spiders books was published, I became obsessed with the topic of my PhD and most recent two books. But I still adore my spiders as much as ever. I hope to have more time to big here now that my new book , The Memory Code, is out. How wonderful to have 4 golden orb weavers. I wonder why they are moving. Mine usually don't do that. It sounds like an adventure to find them each day! It's great that you found the egg sacs. The one in these photos are the only ones I have ever found in my own yard. The numbers each year do seem to vary a lot, but I am not sure that any studies have been done which know why. I have asked arachnologists and they all acknowledge that the numbers can vary hugely year to year, but don't know why. They suspect it is to do with weather. I have no idea where you are. The Cape could be in Australia or South Africa or lots of other places. Where are you? Hello - I just found your site - I hope you are still blogging? I am in Ecuador and just discovered two golden orb weavers. I leaned a lot about them from your site. But - near the webs of mine are uniquely shaped 'cases' that look a bit like the shields men used to wear in battle in medieval times. I have not wanted to destroy one to find out what's inside. Can you explain what they are? Yes, I am still blogging. It's just that recently there has been so much reaction to my latest book, "The Memory Code", that I have been writing on my author blog, http://www.lynnekelly.com.au. I have lots of things that I want to write here about spiders I will do so as soon as possible. That includes writing about my golden orb weaver who has kept me company all summer but died with the first cold weather a week ago. I have no idea what your little 'cases' could be, because I really have no idea what size or shape they might be. If you have a photograph then let me know and I will do my best but I really only know spiders and then know very little about the wildlife of Ecuador. You only have one Golden Orb Weaver in the Americas, Nephila clavipes. We have a lovely golden orb living outside our front window. We have watched her grow to quite a significant size! Her abdomen is about the size of a 10c piece. We were quite upset to see she wasn't at her web for three days and thought she was gone, but today another has shown up. She's the same size in span, but her abdomen is half the size. Could it be her? I thought maybe she went to lay eggs, hence the size difference. Would you be able to shed some light? Thank you for writing, Damon. This is exactly the behaviour when they lay eggs. It will definitely still be her. I have seen this often. I have almost never managed to find the egg sac if there is foliage. They are very good at hiding them. It is also the right time of year for her to grow to maximum size and then produce her egg sac. She may not last much longer. Early winter cold will be the death of her. That is the normal. Enjoy her company as long as you can. The eggs will hatch but they won't gain a size to be noticeable until next summer. Hopefully you will get a new golden orb weaver to observe. Thank you again - I am so glad you have your pet back again, even if only temporarily. Thank you for replying Lynne. You're right! They're good at hiding their babies! I may not have found the egg sack, but she is almost back to full size again and is looking healthy. She's still sticking around, but sometimes I feel like giving her a heater or more shelter just to have her around a lot longer. She is beautiful and I am fascinated! I am so glad that you have had her company for so long, Damon. I lost mine over a month ago. Hopefully there will be her young next year to enjoy. You might like to go out with a torch and see if you have the garden orb weavers at night as well - but that will have to wait until summer too. I'll look forward to your next update. I wish I could send a photo. Guess who is just laying another sack! Really? Great! I am loving these updates! Hello, living in the Florida panhandle area of U.S. and after an unseasonably warm winter, we are up to our ears in Nephilia clavipes. Never seen one before. Very glamorous! Like the Greta Garbo of the spider world. The largest and most resplendent lady built a web marvel between a fig tree and our carport. We have watched her double in size, and my 5 yr old son named her Allen (???). Due to the magnitude of her web and her large size (abdomin pushing 2 inches long) we have nicknamed her "La Reina," or "the queen" in Spanish. My husband lately realized we actually have dozens and dozens of them throughout the bushes on our farm, like rows of fashionable spider condos. I am a complete arachnophobe usually, really severe usually, but La Trina won us over. Helps she's gorgeous and doesn't leave her web. Had to explain to my son why she snacks on her many "boyfriends." We always check on her doings in the a.m. I am ok with a summer of orb weavers, but the idea of eggsacks and an even larger population next year does make me palpitate, in all honesty. Are they going to take over the farm like some old horror flick, or is this a flukey year? Thank you so much for such a delightful story. I am in love with Allen already even without seeing her! She has done you a great service introducing you to the beautiful side of spiders which is the starting point of overcoming arachnophobia. Don't worry about the huge numbers next year. Nephila unknown for having a big population explosion one year and then barely appearing the next. About six years ago we couldn't move in the bush here in Victoria, Australia, because of the huge number of webs of Nephila edulis, the nearest we have to N. clavides. The following year I struggled to find any. We had a few this year, but nowhere near the numbers of that wonderful season six years ago. Thank you so much for writing and please let me know what happens. Allen should get enormous, disappear for a few days making her website, and returned much skinnier. Unfortunately once winter comes she will die. I'd love to hear more of her story. Please give my very best regards do your five year old son. Lovely to have you here! I would not worry at all about a spider invasion. None of those in the egg sac shown here were around for long. I had only one in the garden the next year. My advice would be to enjoy their company while you can. The reason mine came inside temporarily was that I had them in a porch where the only direction they could disperse with breeze was inside as the porch is enclosed on three sides. Moving spiders is risky as they are so delicate. The golden orb weavers also need their big web at this time of year, so I suspect they wouldn't survive the move. 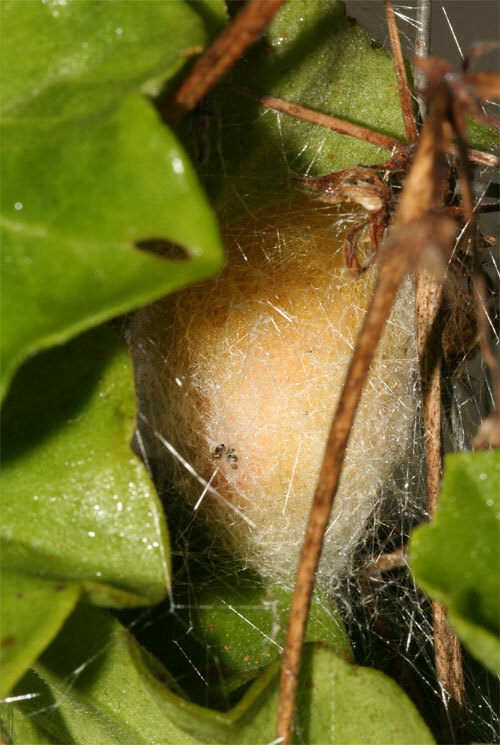 The egg sacs would probably survive it if you put them in a protected area. You don't need to move them while the females are present. They shouldn't hatch yet. Please let me know what happens! Hello Lynne Kelly, I am continuously amazed at how the internet helps spread knowledge. Today I posted on facebook a picture of a beautiful spider that had a wonderful web outside our grandson's bedroom window at our home. A friend in Alaska identified the spider as a golden silk orb weaver. Then she gave me a link to your blog and website. I have observed spiders like other living things in nature but have not actually studied them. I enjoyed reading your blog a comments. i hope to buy your book soon but I am also interesting in your other books and studies. Fascinating! Interesting I observed a small spider in our bathroom and I frequently observed her and knew her home. We became friends but i did not mention "Lucy" to my wife fearing she would not want a spider for a pet. My wife does not normally kill any living thing, wasp, etc. she relocates them But she was bitten by a brown recluse and we try to keep them absent from our home. Thank you so much for such an interesting comment. I get is much pleasure out of watching my spiders. I must get back to blogging them now that my new book is written and off at the publishers for editing. It will be out in April. It was so much work that my beloved spiders have been neglected. It didn't seem to worry them! 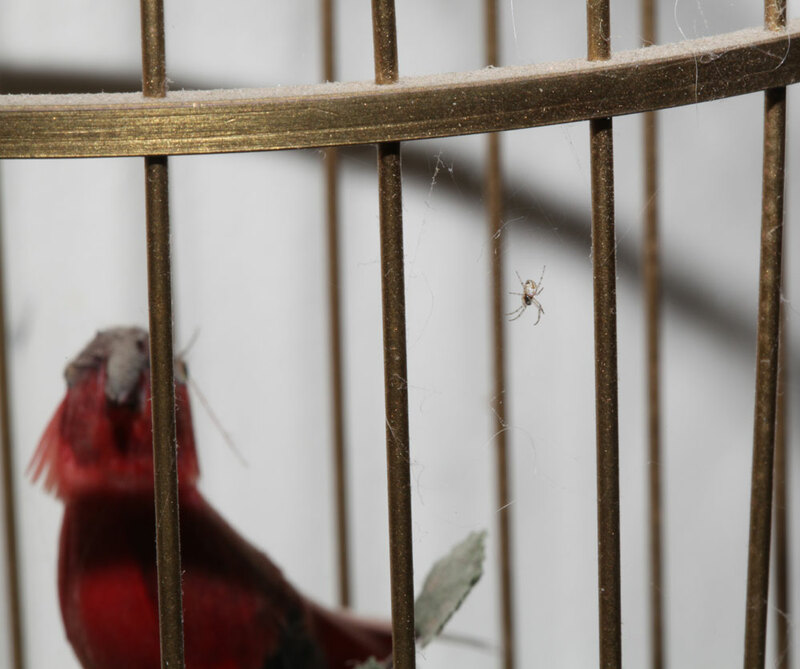 I do hope that your wife might discover the joys of spider watching - especially the goldenrod weavers. They are spectacular! I can understand her reluctance having been bitten by a brown recluse. She is very unlucky for that to have happened. I saw three of them in a wardrobe in the spare room I was staying in when in Texas. Please send any spider stories this way! Oooops - pushed Publish too early! That was supposed to be 'I get SO much pleasure ...' and 'golden orb weavers'. I have no idea what goldenrod weavers are. Thanks so much for your response. I did find the egg sac and moved to my enclosed area of a compost bin next to my garden. I hope to watch them hatch and a couple mature next spring. Life on this planet is so interesting! I look forward to the next instalment! Reality is awesome, isn't it?